Every great guitarist started somewhere. 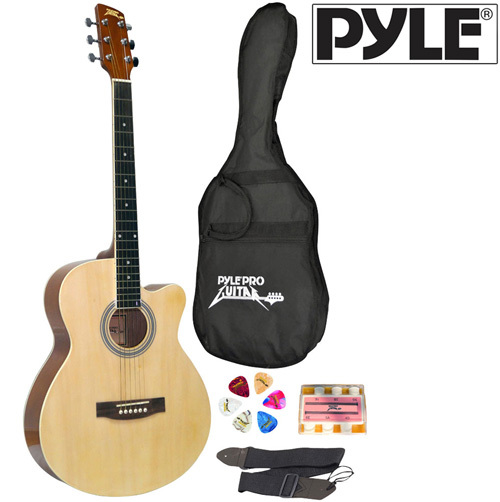 This acoustic guitar from Pyle Pro is perfect for beginners or professionals. The rich, classic sounds of a strumming accoustic guitar are second to none. Whether your Nashville bound, or picking up a guitar for the first time, this Acoustic Guitar from Pyle will meet and exceed you're expectations. Constructed from high quality materials like linden plywood for the top, back, and sides, exotic nanmu for the neck, and maplewood for the fingerboard and bridge. This guitar provides rich, quality sound you've come to expect from Pyle.